WARSAW, Poland (CNS) — Pope Francis will visit the former Nazi concentration camp of Auschwitz-Birkenau during a July 27-31 visit to Poland for the celebration of World Youth Day, the Polish bishops announced. 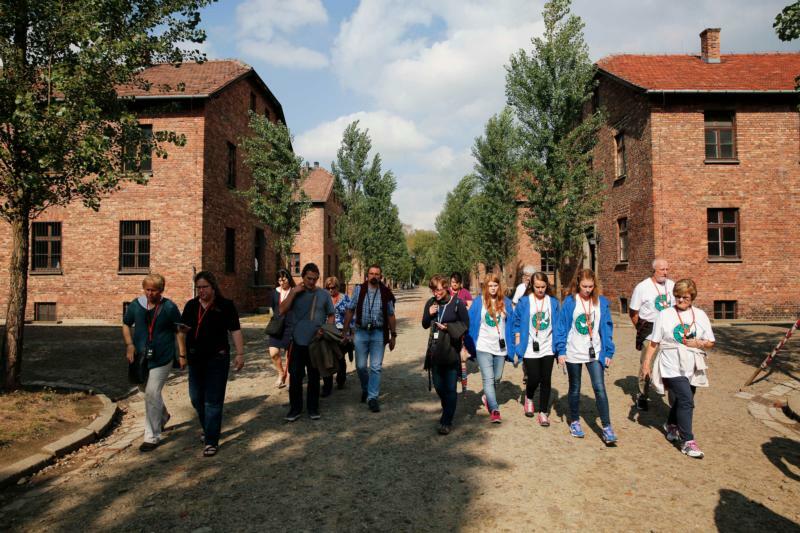 Up to 2.5 million young people from around the world, as well as 20,000 priests and 1,200 bishops, are expected at the July 26-31 youth gathering in Krakow, which is less than 50 miles from the site of the death camp. While the Vatican confirmed the dates of Pope Francis’ trip to Poland, it released no details of the itinerary. Announcing a preliminary schedule March 12, the Polish bishops’ conference said Pope Francis’ visit to Auschwitz-Birkenau will include prayers at the camp’s “Death Wall,” where prisoners were executed, and a stop at the nearby death cell of St. Maximilian Kolbe, who died there in 1941. The pope is expected to address Jewish and other faith representatives and camp survivors at the Holocaust memorial at Birkenau. The Auschwitz tour, which follows visits by St John Paul II in 1979 and Pope Benedict XVI in 2006, will fall on the presumed anniversary of the decision by Conventual Franciscan Father Kolbe to offer his life for another prisoner. That evening, in Krakow’s Blonia Park, Pope Francis will lead a Way of the Cross service. Pope Francis will be welcomed to Poland July 27 by President Andrzej Duda at Krakow’s Wawel Royal Castle and will address Poland’s 117-member bishops’ conference the same evening, before greeting young people from the window of the Krakow archbishop’s Franciszkanska Street residence. The pope is scheduled to travel by helicopter July 28 to Poland’s Jasna Gora national sanctuary in nearby Czestochowa for an open-air Mass marking the 1,050th anniversary of Poland’s conversion to Christianity. At the Divine Mercy center in Krakow’s Lagiewniki suburb July 30, the pope will pray before the relics of St. Faustina Kowalska and celebrate Mass for clergy, seminarians and members of religious orders. After hearing the confessions of some World Youth Day participants at Lagiewniki’s St. John Paul II Sanctuary, Pope Francis will have dinner with a group of young people from around the world. The traditional World Youth Day prayer vigil will be held at Campus Misericordiae near Krakow’s Wieliczka salt mine. Pope Francis’ last day in Poland, July 31, will include the final World Youth Day Mass and the recitation of the Angelus at Campus Misericordiae. He will then meet World Youth Day organizers and return to Rome. A senior Polish government official said priority would be given to security and good communications during the five-day pilgrimage to Poland, which will be the 12th by a pope in the past 37 years. “Today’s world demands a deepening of dialogue on contemporary challenges, and the Holy Father’s voice always has special significance in this field,” said Malgorzata Sadurska, head of chancery for Duda. “We’re delighted so many youngsters will be coming to Poland for this event and count on these meetings with the pope and voices of youth to send out an important summons to peace, values and dialogue,” she said. Poland’s Foreign Ministry has reduced visa charges for World Youth Day participants, who are expected to include at least 400,000 youths from Russia, Ukraine and other former communist countries. The July celebration will be the second international World Youth Day event held in Poland. St. John Paul II presided over the youth gathering in 1991 in Czestochowa.